The Affordable Care Act (ACA) creates state-based exchanges and provides premium subsidies for low and moderate income individuals and families purchasing insurance through these exchanges. The exact dollar amount of the subsidies is not set in the statute, but instead calculated for each applicant using a complex formula prescribed by the legislation. Subsidies are calculated for 2014 based on the following, among other information: the applicant’s household income, family size, applicable area-specific premiums, and legislatively prescribed percentages for enrollee premium contributions. However, in future years the exchange subsidy calculation will become even more complicated by two provisions in the ACA that take effect after 2014. These provisions are likely to increase most exchange enrollees’ share of their premium costs. 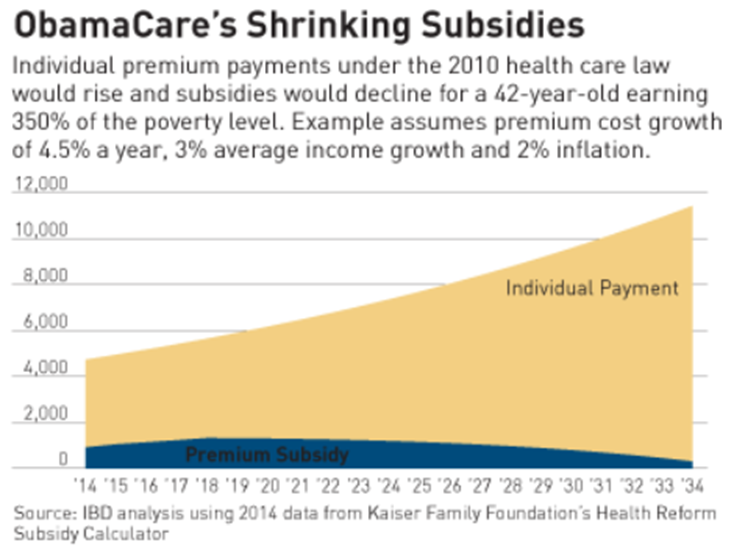 While the adjustments are sometimes referred to as “subsidy caps”, the ACA does not actually place any limitations on the aggregate amount of premium subsidies paid by the federal government. Instead, if total subsidy spending exceeds 0.504 percent of gross domestic product (GDP), the amount that exchange enrollees are expected to contribute, as a percentage of their income, may increase further. As a result, subsidized exchange enrollees at all income levels will see their benchmark premium contribution, the portion of their premium they are required to pay, increase at least 25 percent by 2019. Plans sold on the state based exchanges will be categorized according to their projected actuarial value, which is the ratio of an average enrollee’s covered medical costs that is paid by the health insurance plan compared to the amount paid by the enrollee out of pocket. For example, an insurance plan with an actuarial value of 60 percent pays, on average, 60 percent of medical expenses, and the average enrollee pays 40 percent through cost-sharing (including deductibles, copayments and coinsurance). Plans are grouped into “metal tiers” using their actuarial value projections. Platinum plans have actuarial values of at least 90 percent, Gold at least 80 percent, Silver at least 70 percent, and Bronze at least 60 percent. With the exception of catastrophic plans available to those under 30, plans with projected actuarial values below 60 percent will not be allowed on the exchanges. Federal poverty status, a function of family size and income, is the threshold criterion for exchange subsidy eligibility. In general, individuals are eligible to receive exchange subsidies if their household income falls between 100 and 400 percent of the federal poverty level (FPL). Each applicant is expected to contribute a specific percentage of their income towards the purchase of an exchange plan. As shown in Table 1, this percentage increases along a graduated scale set forth in the ACA based on the applicant’s income relative to the FPL. The second key determinant of a recipient’s subsidy is a rating area-specific benchmark, which is the premium of the second lowest cost silver plan available to that applicant, given the applicant’s place of residence, age, and (in some states) tobacco use. A particular applicant’s subsidy is ultimately equal to the benchmark premium minus the amount the individual or family is expected to pay based on the statutory percentage. That subsidy can be applied to any plan available on the exchange. Table 1 below shows the minimum premium contribution, as specified in the ACA, for determining exchange subsidies in 2014. As explained above, this contribution, as a percentage of income, is merely the contribution for the benchmark silver plan. Individuals and families could pay a lower percentage if they chose a Bronze plan or a higher percentage if they opt for a more expensive Silver, Gold, or Platinum plan. 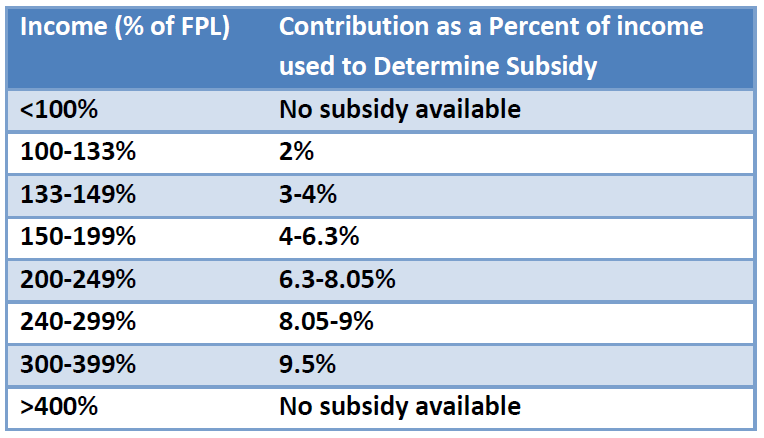 There is no subsidy given to exchange enrollees below 400 percent of FPL if the premium for the benchmark plan is below the applicable percentage of their income. There are two statutory adjustments that may alter these contribution percentages depending on the rate of premium growth. The first is based on the ratio of income growth to premium growth. The second involves premium growth, the consumer price index (CPI), and the total federal expenditure on exchange subsidies as a percentage of GDP. 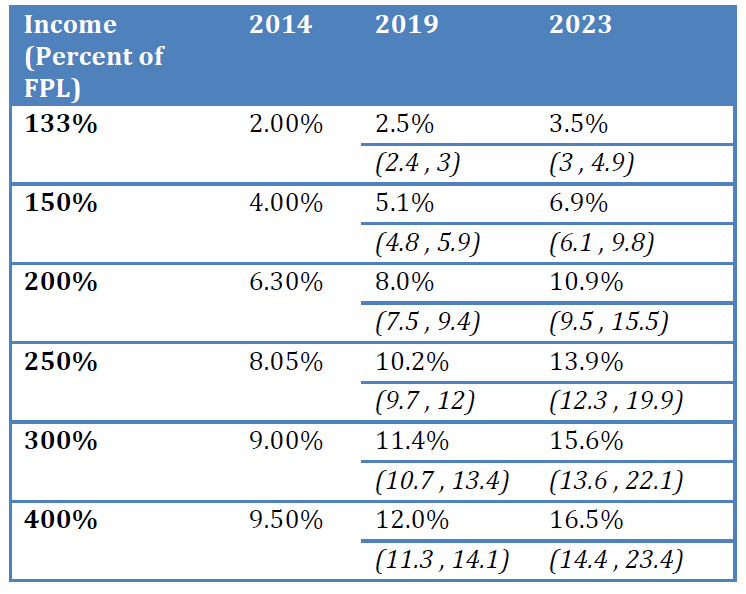 In all years after 2014, if premium growth exceeds income growth, the applicable percentages in table 1 above will be adjusted to reflect the excess. In other words, if the premiums take a higher percentage of income on average, subsidized families will pay a higher percentage for their coverage as well. Specific regulations have not yet been released describing how this adjustment will be calculated. However, the Congressional Budget Office (CBO) incorporated this adjustment into their long-term budget projections and assumed that the adjustment is based on the difference between the average percentage of premium increases from one year to the next for all private health insurance plans for the under-65 population and the change in average US household income for the same time period. The second provision adjusts the percentages starting in 2019 and only occurs if federal aggregate spending on exchange subsidies and cost-sharing reduction payments in the preceding calendar year exceed 0.504 percent of the gross domestic product (GDP). Should this occur, the percentages will be adjusted upward (along with the first adjustment) to the extent that premium growth exceeds growth of the consumer price index (CPI). Another way of putting this is if premiums grow faster than CPI inflation, subsidized consumers will pay more of their income to account for the difference, but only if aggregate subsidies exceed 0.504 percent of GDP. According to CBO the first of these adjustments will maintain the relative percentage of premiums paid by exchange consumers versus subsidies, regardless of fluctuations in average income and premiums over time. As with the first adjustment, the administration has not yet explained how this will be calculated. CBO assumes in their projections that the premium growth will be calculated using private insurance premiums for the under-65 population and the CPI increase for urban consumers (CPI-U). How Likely Are These Adjustments to be Triggered? The comparison of exchange premium costs to CPI is relevant only if aggregate spending reaches 0.504 percent of GDP, but this too is likely. In a recent budget estimate, CBO projects spending on exchange subsidies to equal 0.1 percent of GDP in 2014 and grow to 0.5 percent of GDP by 2023. In the CBO projection, the second adjustment is likely to begin in 2023 or shortly thereafter. Figure 1 below shows the results of a premium and subsidy analysis done by writers at Investor’s Business Daily for an individual at 350 percent FPL in a situation with premium cost growth of 4.5 percent, income growth of 3 percent and CPI inflation of 2 percent. As shown, with these assumptions, the share of income paid toward premium costs increases enough that the amount paid to subsidize that individual decreases significantly over the long-term. Using a national health insurance market model, the American Action Forum (AAF) can calculate projections of federal health insurance exchange spending in the coming decade. According to these calculations, federal spending on premium subsidies and cost-sharing provisions will exceed .504 percent of GDP starting in 2015 and continue to do so throughout the rest of the analysis period (2023). Thus, in 2019, the second income contribution indexing provision will occur, increasing income contributions by the difference between premium growth and growth in the consumer price index. Using these assumptions, we can construct a picture of what income percentages will be used to calculate subsidies for the exchange population. Our estimate assumes 6 percent annual growth in individual insurance market premiums and 2 percent annual growth in household income and the consumer price index. In italics, we also display extreme scenario high and low estimates. The high estimates assume 8 percent annual premium growth and 1 percent annual household income growth and CPI growth; the low estimates assume 5 percent annual premium growth and 2 percent annual household income growth and CPI growth. More information about the assumptions that were used is detailed in Appendix 1. By 2019, all subsidized exchange enrollees will see their benchmark premium contribution (the amount they pay out of pocket) increase by an estimated 25 percent. From 2014-2023 the premium contribution is projected to increase by 75 percent. For families with incomes at 400 percent of FPL their benchmark premium contribution is estimated to increase from 9.5 percent of income in 2014 to 12 percent in 2019 and 16.5 percent in 2023. Per the above example a couple earning $62,040 annually would be expected to pay $5,893 towards their health insurance premiums in 2014, an estimated $7,444 in 2019 and an estimated $10,237 in 2023 (in 2014 dollars). It is necessary to note that the AAF model projects subsidies to grow beyond .504 percent of GDP in 2015, as opposed to the CBO projection of 2023. The model predicts higher exchange enrollment as well as higher per-enrollee costs for premium subsidies and cost-sharing reduction payments. One limitation of this analysis is that the inputs were created prior to the launch of the health insurance exchanges and could be impacted by technological issues with the rollout. As insurance premiums increase, the federal subsidies will remain relatively constant until 2019 when they will begin to decrease, shifting the burden onto exchange enrollees. 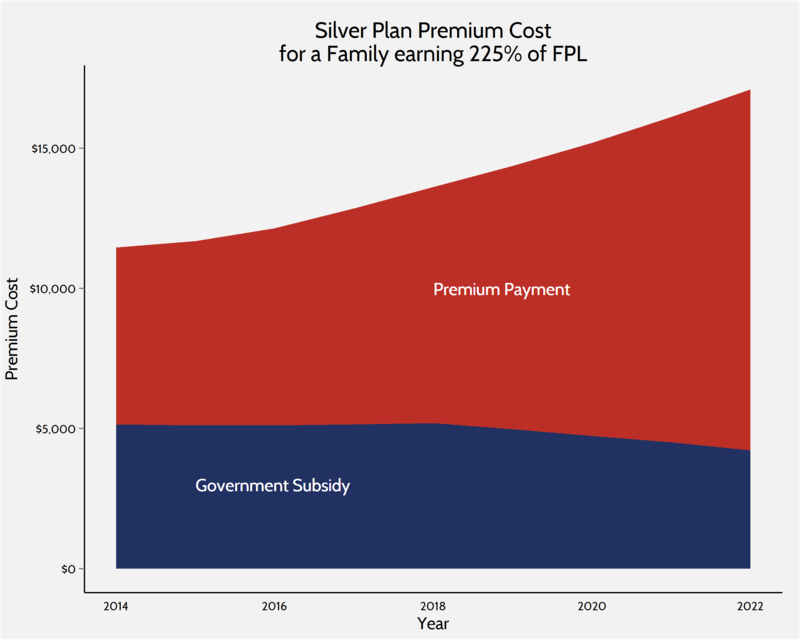 The chart above illustrates premium support the relative contribution of the federal exchange subsidy to the insurance premium for a family earning 225 percent of the federal poverty level and enrolled in a Silver plan. Health care spending has grown relative to national GDP for decades, but this relationship cannot continue indefinitely—it would be impossible for the US to spend 100 percent of GDP on health care. By that token, health insurance premium growth is likely to eventually equalize to the average growth in income. This analysis makes no attempt to postulate as to when that might occur, but research suggests we may not yet be close to that threshold. While the administration has yet to issue specific regulations regarding the exchange subsidy adjustments, it is important to understand how this provision may impact household spending on health plans. Should the ACA fail to temper health care cost growth, individuals buying their insurance on the exchanges, even those with lower incomes who are receiving subsidies, will pay more of their income towards their health care than proponents of the ACA have lead them to believe. For current federal poverty thresholds, see: http://aspe.hhs.gov/poverty/13poverty.cfm#thresholds. Per the statute, if an applicant's income is below the Federal Poverty Level, they will not be eligible for subsidies. In some states, those individuals will be eligible for Medicaid. If the applicant choses a plan that costs less than their subsidy amount, they can wind up with a $0 premium, but they are not refunded the additional subsidy. In order to produce estimates of the subsidy adjustment provision, it was necessary to make assumptions regarding premium growth, household income, consumer price index. Growth in real household income has been low since the recession, and often negative. Assuming that the US economy continues to recover over the next decade, real household income is likely to increase by about 2 percent a year, similar to historical growth rates in other times of economic growth. However, real household income growth could average as low as 1 percent per year. Health insurance premiums have seen high growth rates for the last decade, but those rates have declined in recent years. Based on a small sample of individual insurance rate filings, ASPE found that the average growth rate declined from 8.1 percent in 2012 to 7.9 percent in 2013. In the controlled health insurance exchanges, American Action Forum health care policy experts estimate that premiums will grow at about 6 percent per year on average. A higher possible estimate is the 8 percent figure cited by the Office of the Assistant Secretary for Planning and Evaluation (ASPE), or premiums could grow as slowly as 5 percent annually. These figures were used to create an upper bound and a lower bound estimate. The consumer price index, a measure of inflation, has increased at a growth rate between 2 and 3 percent per year for a decade prior to the 2008 recession, and is beginning to stabilize, growing 2.1 percent in 2012. The American Action Forum model assumes a 2 percent growth rate in household income and the consumer price index. A lower bound CPI growth rate of 1 percent was also coupled with a high premium growth rate of 8 percent to project an upper bound estimate of subsidy adjustment. The lower bound estimate was based on the assumption of 2 percent CPI growth and a lower premium growth rate of 5 percent.